Buy now Feltia album from our store! You can also download Luna Obscura Music on iTunes! 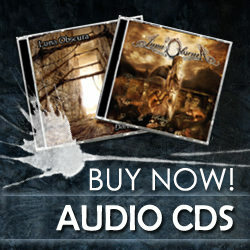 Buy now "Feltia" Audio CD and MP3 directly from CD Baby! Merchandise is now available! Winter Sales Started! Hey guys! It's been very long time but finally our official website has been updated.From now on, you can be informed here about our future plans and read the news first! All the technical problems of the last months have been solved. Our official store is now back and revamped so have a look. A winter sale period started for Luna Obscura with discounts from 15% and 25% on Special Offers items. Go there, take a look around and get whatever is catchyfor you in a cheap price! And remember! By purchasing the Merchanside here you're direcly supporting Luna Obscura.